The inspiration for the French baby nursery that I have titled as her "Ooh La La Paris Nursery" actually came from Nick Jr. 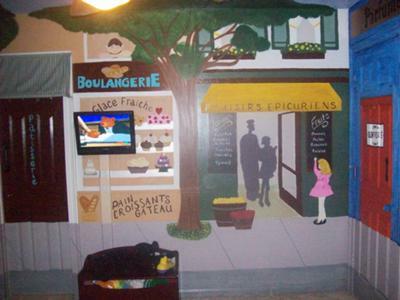 Many of their shows inspire children to use their imagination and what better way to inspire my daughter to use her imagination than to create a fantasy world where she can prepare food in her own restaurant, pretend to buy food at a French market or bakery, flowers at a florist, perfume at a Parisian parfumerie and the the latest fashions in shoes and clothes. Plus, she can stop by a pet store and enjoy the beauty of the Eiffel Tower, all without leaving her nursery in Louisiana. 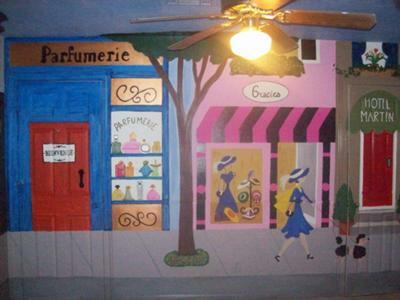 I painted the French wall mural using latex enamel paints in a number of different colors. 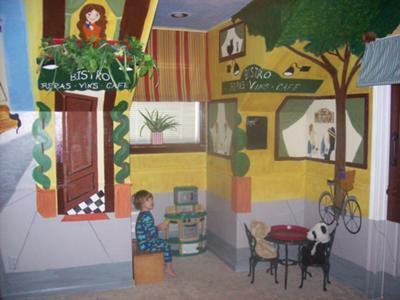 I painted the entire nursery myself and the entire project took me one month to complete. The only assistance that I had was my two year old daughter by my side as she pretended to help me paint the focal point of my baby girl's French baby nursery decor. The best part of decorating and compiling baby nursery ideas for our Ooh La La Paris nursery theme was watching my daughter talk to the waiter as she served her stuffed animals lunch at the table in the bistro when it was finished. 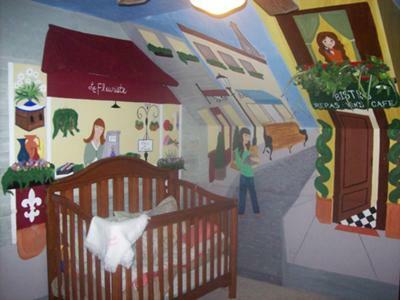 I enjoy painting so the Parisian nursery mural was a relaxing project for me. The crib is a convertible Simmons crib that we purchased from JCPenney. The window treatment is a homemade awning created from curtain valances. I used cafe curtain rods and extensions to give it and the other Parisian style "awnings" around the room a 3D appearance. What I love most about my baby girl's room is knowing that she will enjoy it for years to come. She is limited only by her own imagination in her role playing. Join in and write your own page! It's easy to do. How? Simply click here to return to FRENCH POODLE NURSERY.